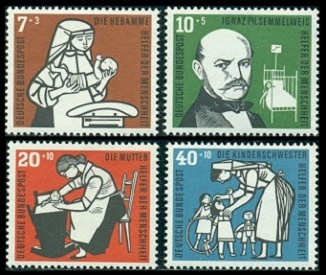 Republic of Germany stamps issued during 1956 featured commemorative postage stamps and surtaxed pictorial stamps for charity. The 20 Pf. denomination stamp shown above, at the left (Mi. #227, Sc. #738), was issued on January 7, 1956 to commemorate the 125th Anniversary of the Birth of Heinrich von Stephan (1831-1897), the co-founder of the Universal Postal Union. The 10 Pf. denomination stamp shown above, at the right (Mi. #228, Sc. #739), was issued on January 27, 1956 to commemorate the 200th Anniversary of the Birth of Wolfgang Amadeus Mozart (1756-1791), one of the most popular classical composers of all time. The 10 Pf. denomination stamp shown above, at the left (Mi. #231, Sc. #742), was issued on June 9, 1956 to publicize the Olympics Year. The 1956 Winter Olympics were held in Cortina d'Ampezzo, Italy. The 1956 Summer Olympics were held in Melbourne, Australia, with the equestrian events being held simultaneously in Stockholm, Sweden. The 10 Pf. denomination stamp shown above, at the right (Mi. #234, Sc. #743), was issued on July 28, 1956 to commemorate the 100th Anniversary of the Death of Robert Schumann (1810-1856). 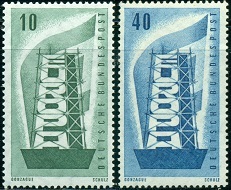 The two surtaxed pictorial Germany stamps shown above (Mi. #232-33, Sc. #B348-49) were issued July 21, 1956, featuring the theme of Youth Activities. The surtax benefited the Youth Hostel Organization. The two commemorative Germany stamps shown above (Mi. #235-36, Sc. #744-45) were issued on August 8, 1956 to celebrate German Evangelical Church Day and to publicize the Meeting of German Evangelical Protestants at Frankfurt-am-Main during August. The 20 Pf. denomination stamp shown above, at the left (Mi. #237, Sc. #746), was issued on August 11, 1956 to commemorate the 1st Anniversary of the Death of Thomas Mann (1875-1955), the great German novelist and the winner of the 1929 Nobel Prize in Literature. The 20 Pf. denomination stamp shown above, at the right (Mi. #238, Sc. #747), was issued on August 24, 1956 to commemorate the 800th Anniversary of the Dedication of the Maria Laach Abbey. The stamp design features a line drawing of the Benedictine abbey, located on Lake Laach, near Andernach, in the Rhineland-Palatinate. Its original name, "Laach Abbey", translates to "Lake Abbey", denoting the abbey's physical location. The 10 Pf. denomination stamp shown above, at the left (Mi. 239, Sc. 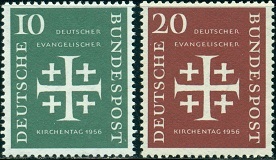 #750), was issued on August 29, 1956 to celebrate German Catholics Day and to publicize the 77th Meeting of German Catholics at Köln (Cologne) on August 29. The 10 Pf. denomination stamp shown above, at the right (Mi. #247, Sc. #752), was issued on October 27, 1956 to celebrate Stamp Day. The design features a pigeon holding a letter. This celebration of stamp collecting is held annually, to encourage public interest in philately. The two tall-format Germany stamps shown above (Mi. #241-42, Sc. #748-49) were issued on September 15, 1956 to celebrate the economic Cooperation between the member countries of the European Coal and Steel Community. The design features a symbolic reference to the Rebuilding of Europe. These 1956 European Community stamps gave birth to a new thematic philatelic specialty, "EUROPA", and to this date, every member country of the modern day European Union issues a set of EUROPA stamps each year. The four surtaxed Republic of Germany stamps shown above (Mi. #243-46, Sc. #B350-53) were issued on October 1, 1956, with the surtax benefiting Public Welfare. 07 Pf. + 03 Pf. - A midwife weighing a newborn child. 10 Pf. + 05 Pf. - Dr. Ignaz Semmelweis (1818-1865). He was a Hungarian physician that pioneered antiseptic procedures, especially in respect to Child-bed Fever, which had a 10% - 35% mortality rate at that time. 20 Pf. + 10 Pf. - Mother tending to her child in a cradle. 40 Pf. + 10 Pf. - Nurse with children. The 10 Pf. denomination stamp shown above (Mi. #229, Sc. #740) was issued on February 17, 1956 to commemorate the 100th Anniversary of the Death of Heinrich Heine (1797-1856), the famous German poet, journalist, essayist, and literary critic. The 20 Pf. denomination stamp shown above (Mi. #230, Sc. #741) was issued on May 2, 1956 to commemorate the 1,000th Anniversary of Lüneburg, an early center of salt production. The 20 Pf. denomination stamp shown above (Mi. #240, Sc. #751) was issued September 1, 1956 for the International Police Exhibition in Essen during September. The 10 Pf. denomination stamp shown above (Mi. #248, Sc. #753) was issued on November 17, 1956 in memory of the People of Germany that Died during World War II and to promote the Society for the Care of Military Cemeteries.